Derived from the earlier “stereo record player”, uses the SP series pickup, normally SP 6 or SP 7. Can be fitted with an optional preamplifier/RIAA filter panel for use with older equipment or Beomasters such as Beomaster 900. The motor is synchronous, speed regulation is achieved using an axial centrifugal regulator, which is user adjustable to alter the pitch. A strobe ring on the platter hub allows the correct speed to be adjusted, this works at 33RPM. A 78RPM speed is provided, but a special wide radius pickup is needed to use this. There are no automatic functions, though a cueing lever is provided. Text copyright © Beocentral. Unauthorised reproduction prohibited. The Beogram 1000 was available in two versions, the 1000V, for use with the Beomaster 1000, 3000, Beocord 2000 De Luxe, 2400 etc, where the output from the pickup went directly to output lead, and the 1000VF, which included a pre-amplifier and equaliser (type GF3) that raised the output level to the DIN standard for a tape recorder or radio tuner. This was needed for the Beomaster 900, Beocord 1500 and 1800, and non-B&O equipment with no amplifier or equaliser for magnetic pickups. 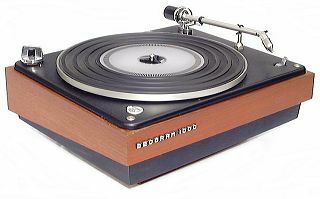 It could also be used to connect it to the second turntable input of Beomaster 1000, so that two Beogram 1000s could be used. Text copyright © Beocentral. Unauthorised reproduction prohibited.